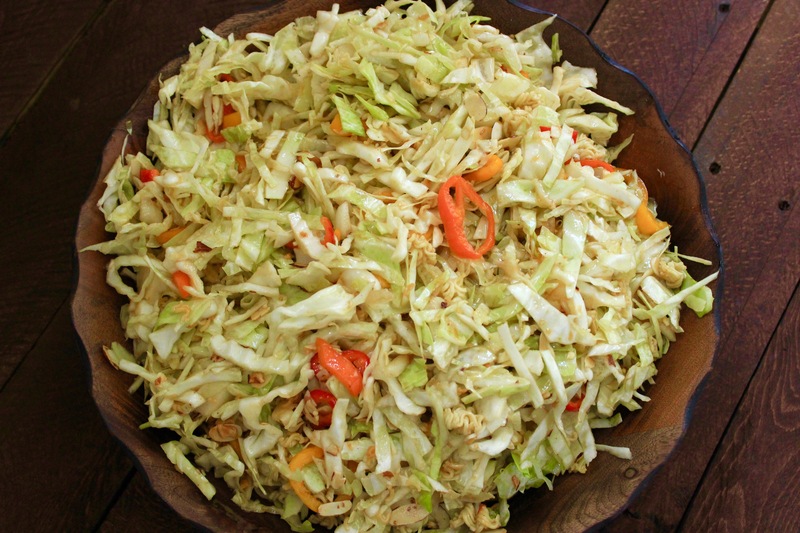 This is my rendition of the famous Chinese Cabbage Salad! I’m in love with sweet peppers and the best thing I ever did was add them to this salad. I think I could eat myself sick =) This is my go-to salad when I need something quick and pretty that not only the ladies will eat out of obligation to their health. Or their waistline. Whichever reason it is that ladies eat only green vegetables! In all honesty, I absolutely love a good salad. I rate restaurants on the quality and freshness of their lettuce. I’ll choose a taco salad over a taco. A chicken salad over a sandwich. Its my thing. The only time I couldn’t choke down a garden, fresh veggie was when I was pregnant with Declan. The exact time I felt like I should be downing bags of spinach by the handfuls and drinking carrot/red beet smoothies. (Does anyone even do that?) I was sickened at the very thought of eating broccoli or anything else that looked healthy. …. But, before that….My sister and another friend were here visiting. I was getting quite suspicious that this might be the moment. Right after the pregnancy test showed two little, pink lines… (before the morning sickness set in!) I went into green mode. Anything fresh. Anything dark. They commented that I became quite the health freak overnight. Literally! Haha. I’m laughing just thinking about it. I ate spinach wraps on whole wheat tortillas with slices of hard boiled eggs for lunch. Unsweetened oatmeal for breakfast. And of course some kind of oversized salad for dinner. I was making sure that this baby had all the vitamins and minerals it needed to develop into a healthy, human being. Finely shred the head of cabbage; do not chop. 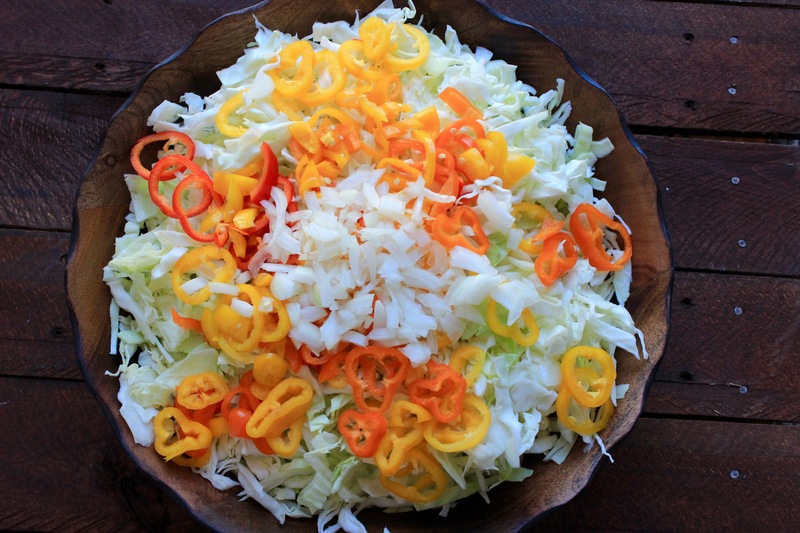 Combine the green onions, peppers, and cabbage in a large bowl, cover and refrigerate until ready to serve. Make the crunchies: Melt the butter in a skillet, add the ramen noodles, and almonds. Toast until golden brown. Stirring frequently. Make the dressing: In a small saucepan, heat vinegar, oil, sugar, and soy sauce and seasonings. Bring the mixture to a boil, let boil for 1 minute. Remove the pan from heat and let cool. 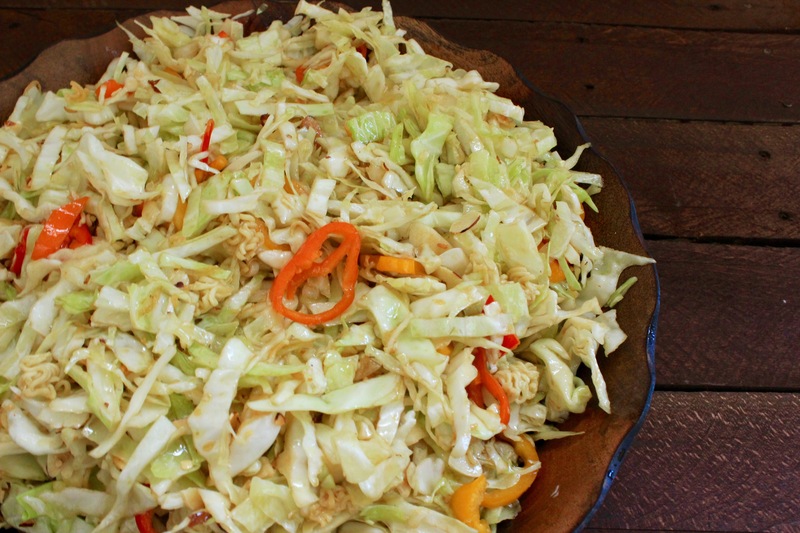 Combine dressing, crunchies, and cabbage immediately before serving. Serve immediately.